Ships are usually the most expensive cards in a deck. Playing one often takes up most, or sometimes even all counters for that turn, so why would you ever want to destroy your own ship and pay a whopping four counters to do that as well? Here are some ideas. • Defense against Kruge (Instinctive Commander): even if your opponent takes command of your ship with Kruge (or with the new Borg mission Assimilate Starship in Tacking into the Wind), you are still the owner of that ship and thus you can target it with Extreme Measures. If your opponent was greedy enough to not only steal your ship, but uses it actively as well, you can now pull a Kirk a blow those filthy, ship-stealin' Klingons out of the stars. (Note that blowing up your unique ship opens up the chance for the Klingon play to steal it again if you play another copy of that ship). • Replay a stranded ship: if you have run out of staffing icons on a unique ship (a situation which might become more and more common with all the new cards that ask for higher staffing requirements in Tacking into the Wind) and only have extra copies of that stranded ship left in your deck, Extreme Measures now allows you to get rid of that ship and play it again where you have personnel to staff it (and salvage some extra counters in the process). • Re-use ''when you play...'' abilities on ships: some ships like the Vetar or the Fortune grant you a bonus when you play them. While highly situational, it could come in handy in some games. • Re-use ''when you play...'' abilities on personnel: why stop at looping ship abilities? Just leave personnel that let you trigger impactful abilities upon playing aboard the ship you blow up with Extreme Measures, and you immediately get to replay those personnel and exploit people like Alexander Rozhenko (K'mtar), Jean-Luc Picard (Vintner) or Harrad-Sar (Slave of the Situation) again. • Generate extra counters: With a cost of four counters, and the additional cost of destroying a ship, our new event seems to be a costly affair. However, there are some tricks to walk out with net bonus in counters. The key to doing this is to combine Extreme Measures with ships that have a high printed cost, but that can either be played cheaper or that grant a bonus when played.. The two best ships for this are probably the U.S.S. Enterprise (Where She Belongs) and the U.S.S. Defiant (Repurposed Warship). The Enterprise has a printed cost of seven, but can be played for only three counters. 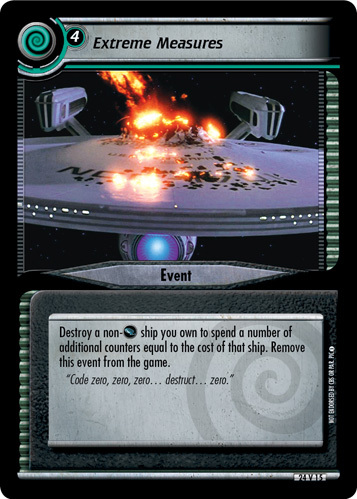 The Defiant costs seven counters, but immediately lets you spend five additional counters if you command non-headquarters missions in the gamma quadrant only. The cost of both ships can of course be reduced by Miles O'Brien (Smiley) and Zefram Cochrane (Ready to Make History). A suggestion for a simple deck that uses Extreme Measures in combination with the U.S.S. Defiant and some Engineer discount will be added here later.